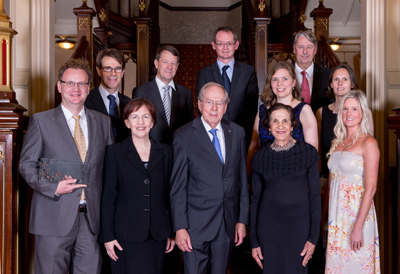 NSW Governor, Her Excellency Marie Bashir AC CVO handed out trophies to prize winners across eight categories during the 2013 NSW Science & Engineering Awards ceremony at NSW Government House, Sydney on Friday 1 November. Winners were announced by the NSW Chief Scientist and Engineer, Professor Mary O’Kane, who praised the high standard of work being undertaken across the sciences in NSW, not only in research, but also in teaching. Professor O’Kane said there was a great response to the call for nominations across all award categories. She commended both the winners and nominees alike for the brilliant work they have been doing to make NSW a strong research and innovation hub. Laureate Professor Graeme Jameson AO, from the University of Newcastle, was named NSW Scientist of the Year for his trailblazing work in the field of floatation technologies. Professor Jameson received $55,000 in prize money for taking out the top prize. His creation, the Jameson Cell, has redefined mineral processing, with mining companies in 25 countries now using the technology to separate valuable minerals from host rock. The Cell adds more than $3 billion in minerals exports to the Australian economy annually.